The call involves a complete transformation (meditation one) involving consequences (meditation two) that demand overcoming evil with good (meditation three). Portents of the cross accompany such a call, (miscellany) for the words of Jesus are as true now as they were then: "Whoever does not take up their cross and follow me cannot be my disciple." But like Peter said when other disciples were abandoning him because Jesus sayings were too hard, "To whom would we go? You have the words of eternal life." The sacred call is transformative. It is an invitation to our souls, a mysterious voice reverberating within, a tug on our hearts that can neither be ignored nore denied. It contains, by definition, the purest message and promise of essential freedom. It touches us at the center of our awareness. When such a call occurs and we hear it - really hear it - our shift to a higher consciousness is assured. But whether small or great, and no matter what the stage or grade of life, the call rings up the curtain, always, on a mystery of transfiguration � a rite, or moment, of spiritual passage, which, when complete, amounts to a dying and a birth. The familiar life horizon has been outgrown; the old concepts, ideals, and emotional patterns no longer fit; the time for the passing of a threshold is at hand. The liturgy is not interested in concepts but in concrete Christian life; it shows what it means to be chosen by God and what mission the choice involves. Nor is the liturgy interested in any abstract theology of God's choice; it intends rather to show us the God who chooses. All this is relevant to us. We do not need theories about God's choice. We know for a fact that through our baptism we were chosen by God. Indeed, the name given in antiquity to those preparing for baptism was "the elect, the chosen." What they were elected to and chosen for was to share in God's life and to accept the consequences of that sharing. We must accept those consequences in our own lives. The followers of Christ have been called to peace. … And they must not only have peace but also make it. And to that end they renounce all violence and tumult. In the cause of Christ nothing is to be gained by such methods. … His disciples keep the peace by choosing to endure suffering themselves rather than inflict it on others. They maintain fellowship where others would break it off. They renounce hatred and wrong. In so doing they over-come evil with good, and establish the peace of God in the midst of a world of war and hate. 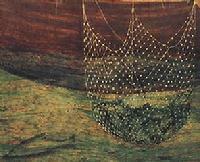 from the hymn "They cast their nets in Galilee"
The Byzantine influence upon Duccio is unmistakable. I love Duccio and I love this painting. Jesus stands against an iconic mountain on the land, calling to the two disciples in the boat upon the water against a blank, golden sky. The fish alone seem animated - the viewer sees time suspended, a moment encoded with portents and possibility. Reality is not like the painting. Seagulls swarm the boat, women and vendors wait impatiently on the shore. Old men watch, assessing everything from the fishermens' bodily strength, to the weave of the nets, to the condition of the boat, to the catch. Children run around. Feral cats and stray dogs wait stealthily for scraps. Duccio's scene, pared down like an icon, lacks only one thing; the viewer accepting the invitation to step in. 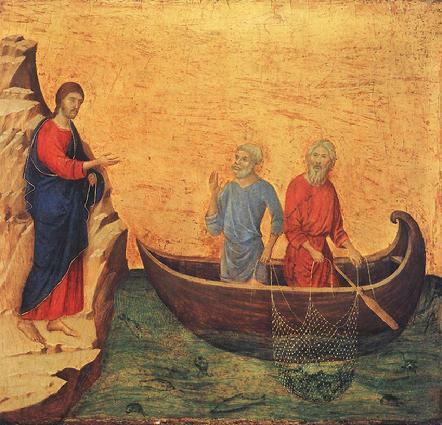 The painting draws me into the scene, placing me in the boat between Jesus and Peter. I feel Andrew turning around. I'm caught between Peter's hard gaze and Jesus' outstretched hand. Situated in this way, I hear the words of Jesus addressed not only to Andrew and Peter but to me. "Come, follow me, and I will make you fishers of people." No doubt we'll sing “They cast their nets in Galilee” this Sunday. I love the hymn, and I'm glad I learned it when I was a little girl. But pretty early, certainly by the time I was a teenager, I took a dislike to part of the hymn when I observed how complicated life is, not to mention watching the complexity of my own inner life unfolding. such happy, simple fisher folk, before the Lord came down. The author, William Alexander Percy, had his own share of tragedy and deep unhappiness in his life. Did he long for some kind of idyll, where life was simple, happy, offering contentment and peace? Just because you fish for a living, doesn't make family dynamics less entangled, village prejudices less difficult, political realities less convoluted than at any other time or place. And even a casual reading of the Gospels show Peter and John to be complicated characters. Young John who trimmed the flapping sail,homeless in Patmos died. The peace of God, it is no peace,but strife closed in the sod. Yet let us pray for but one thing - the marvelous peace of God. The Call continues to turn me inside out. All my own complexities become incense offered in the crucible of ongoing redemption. The more dross that burns away, the deeper I find that alchemical peace at the center of my being.